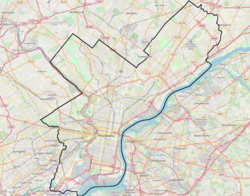 Callowhill is a neighborhood in Philadelphia, Pennsylvania. It is roughly located in the vicinity of Callowhill Street, between Vine Street, Spring Garden Street, Broad Street, and 8th Street. It is named for Hannah Callowhill Penn, William Penn's second wife. Callowhill was formerly home to large-scale manufacturing and other industries, of which an architectural history has been left in the form of grand old abandoned factories. During the 1970s and 1980s, the population of Callowhill plummeted, and although numbers are rising, it is a fairly unpopulated section of the city compared to surrounding neighborhoods. Recently developers have started to employ adaptive reuse projects, converting them into loft style housing; so much so that many have termed the neighborhood "The Loft District". In 2010 the Callowhill Industrial Historic District was added to the National Register of Historic Places. Crowds attending the opening of The Rail Park. The former Reading Railroad train trestle, the Reading Viaduct, is a defining feature of the Callowhill neighborhood. Neighborhood groups have proposed that the abandoned structure be maintained as a public park. The Reading Viaduct park plan gained momentum in 2009 when Philadelphia's Center City District (CCD), and its influential president Paul Levy, became enamored of the idea and ultimately became a partner to help manage the project. CCD announced on Tuesday, February 6, 2018 that the first phase of the quarter-mile-long, elevated park would open in spring 2018. The actual grand opening of The Rail park was held on June 14, 2018, attracting a large crowd. ^ "The Life And Death Of Callowhill | Hidden City Philadelphia". hiddencityphila.org. Retrieved 2018-10-02. ^ Loft District Property Phillymag, 27/03/2015. ^ "Gritty Callowhill is recognized as National Historic District". PlanPhilly | Gritty Callowhill is recognized as National Historic District. Retrieved 2018-10-02. ^ Steuteville, Robert (2016-08-09). "USDOT seeks to reconnect Philly neighborhoods". CNU. Retrieved 2018-10-02. ^ "History - Reading Viaduct Project". Reading Viaduct Project. Retrieved 2018-10-02. ^ Blumgart, Jake (October 31, 2016). "First phase of Rail Park construction underway". Plan Philly. Retrieved April 6, 2018. ^ Romero, Melissa (February 7, 2018). "Rail Park opening delayed until spring 2018". Curbed Philly. Retrieved April 6, 2018. ^ "PHOTOS: Philadelphia's First Rail Park Is Officially Open". Philadelphia Magazine. 2018-06-14. Retrieved 2018-10-02.